A few years ago we were looking at the very real possibility of a big screen adaptation of every popular board game on the face of the Earth. Ridley Scott was to bring us Monopoly, Ouija is now being turned out as a found footage chiller and we can expect everything from Cluedo to Snakes and Ladders to heave into our local multiplex before long. Battleship is, if nothing else, first. It’s Transformers-on-Sea they cry and sadly they are right. Liam Neeson is a grumpy admiral overseeing a bout of Naval war games in Hawaii when aliens take an exploratory radio signal beamed to their planet (in the form of a huge fricking space-spanning laser beam) as an invitation to pop by and invade. Some strange plot convolution causes three ships to be cut off from the rest of the fleet along with three alien ships (imagine angry mechanised turtles and you’re halfway there) and the battle begins. That’s it. For two hours. 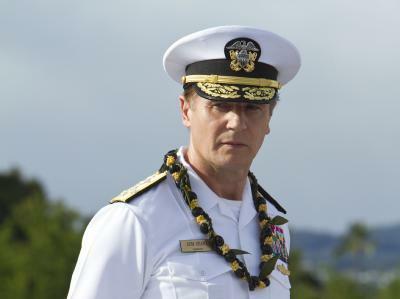 There is a perfunctory personal aspect to the relationships with Grumpy Admiral Neeson’s supermodel daughter played by Brooklyn Decker caught up in a tryst with crap seaman Taylor Kitsch who has to convince his superior and potential father-in-law that he has what it takes to be a Naval officer and father of grumpy little grandchildren – no surprises as to how this ends up. As each of the relationships are set up – rival Japanese captain, successful older brother officer type, plucky petty officer with determination and gusto etc – you know exactly how things will play out. Only once does even a modicum of self awareness glimmer through the INCREDIBLY LOUD THINGS happening on screen when a character asks, after a particularly absurd exchange of ‘movie’ dialogue, ”Who talks like that?’ before the moment is lost and we’re beating our chests and marvelling at this long and tediously inane fireworks display once more. Universal’s marketing made no apology for the fact that the extravagantly expensive film of theirs had its beginnings as a board game, and whether we’ll ever see Monopoly, Candyland or Mouse Trap spin through the Hollywood machine the fact remains that any property is fair game. If there’s an inbuilt audience or, as it is soul-destroyingly called, ‘brand awareness’ then it’s a fair hook to hang a movie on. Set out your stall, gather well known actors to bring in the crowds and then stand back and hope those hours spent hunched over the plastic battlefield have seeped into the general consciousness thus satisfying a nostalgic desire as well as dazzling people with the pretty explosions. This time however it won’t. 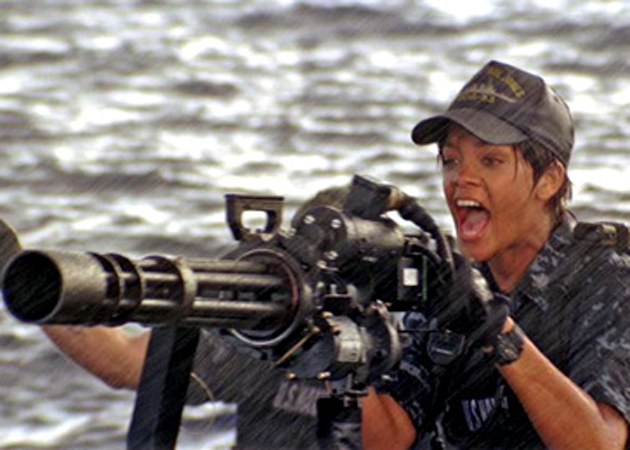 Peter Berg’s Battleship wavers between disoriented action movie and outright acceptance of Michael Bay as Lord and Saviour. Taylor Kitsch gives everything to try and win our hearts despite the paper thin character and cut and paste dialogue he and every other character inherits from the last two decades of chest thumping, patriotic cinema. The true crime here is that nothing new is tried and there is no ambition; slow motion photography does not equal drama, the guitar twang of an American rock classic does not endear me to you, switching between the cold dark blue of midnight, the bright burn of dawn and back to a charming subset to suit your want for pretty backgrounds regardless of the actual sequence of events sends signals to me that you don’t trust me to even notice when the day doesn’t run in the correct order. The audience I saw the film with reacted with disbelieving laughter at the serious moments and with outright incredulity at one particular moment towards the end when the final plan is revealed. The tone is so uneven that you have no idea if the filmmakers are serious at any time but tongue remains firmly out of cheek and we’re deprived of even a good laugh at the silliness of it all. Trawling the cinematic oceans with a vast and unfussy net enables you to drag up the clichés you need for those tickboxes, but without a firm hand to filter out the unnecessary bilge you’re doomed to serve up a bloated, witless and hollow mess and that’s what is on offer at your local cinema from tomorrow. Some of the design is pretty sound, a few moments during the bombastic onslaught of the CG avalanche which constitute the set pieces were quite fun but for all the skill involved, and there is certainly is some behind and before the camera, nothing can save this from being an overlong exercise in contempt for the audience. As I was walking out I heard two people saying it was good if you switch off your brain. I advise to keep your brain switched on and use it to go and see something good and stem the flow of these reductive nonsense from our cinemas.